Financing enables you to sell more equipment, more frequently, to more customers. Your successful business customers typically look for financing options. A constantly changing business environment makes managing cash flow both challenging and critical. Technology changes everyday - presenting both the opportunity and the need to acquire new equipment. Today’s successful business leaders are able to balance cost cutting, preserve business capital and take advantage of adopting new equipment. Financing with Manitowoc Foodservice is the solution. Manitowoc’s flexible financing allows your customers to acquire equipment solutions without an up-front cash investment. We offer financing options with flexible terms and payment options. Flexible Financing Structures: Terms and a payment schedule to fit your customer’s cash flow. Fast Turnaround: Usually within 2 hours • Simple One Page Documentation: Close faster with single-page financing documents. Financing enables a customer to make payments over time rather than investing a lump-sum of cash upfront. Monthly payments can be tailored to fit customer budget levels or revenue streams and may be tax deductible. Financing reduces upfront costs, allowing your customers to obtain the assets they need now without affecting cash flow. It preserves working capital and existing credit lines and frees up cash for other operational expenses. Financing provides flexibility that purchasing does not offer, such as: 100% financing with no money down, payment structures that match cash flows or business cycles, and a variety of end of term finance options. You may be able to deduct all or a portion ofa your equipment cost in the year it is purchased, depending on the amount. Any amount over the first year deduction “cap” may also be depreciated over the next several years, giving them an ongoing tax deduction (Consult your accountant for actual tax saving for financing your Manitowoc purchase). Just about any piece of Manitowoc Foodservice equipment can be financed Any piece of Manitowoc equipment that produces income or saves time and labor can be financed, including remote condensed systems, ice and water dispensers, and more. In most cases, just one phone call is all it takes to get the process started. Depending on the transaction size, credit approval and preparation of finance documentation take in the same day. Credit applications can be received directly from your customer, via email, taken over the phone. Once we receive the completed application, a credit decision is made within 2-4 hours. Once installation is completed, email the invoice and we will call the customer to confirm delivery. 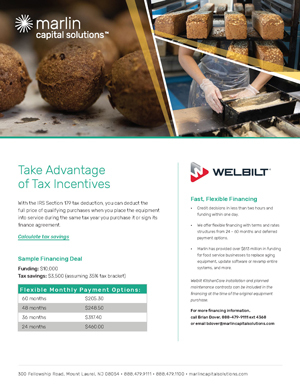 If you finance a piece of qualifying equpiment or software with Manitowoc Finance, you can deduct the full amount of equipment (up to 25,000 dollars) without paying the full amount in 2015 In fact, the amount you save in taxes could be greater than what you pay in the first year of a lease. Your equipment is making you money from day to day! *Credit and equipment restrictions apply. This program does not assume your company will qualify to take advantage of IRS Section #179. Please consult your tax advisor or accountant for additional information. Equipment must be purchased and placed in service by 12/31/15.